It took me a while to figure out that St. David’s was the name of the parish in the Episcopal Church from which Church of the Messiah had been birthed. Long before the present scandals in the Episcopal Church, the members and leadership of St. David’s Episcopal Church decided that it was time to separate themselves from that branch of the larger Church and set out on a new mission. They founded Church of the Messiah and joined the (then fledgling) International Communion of the Charismatic Episcopal Church. I came along two years later; I had none of the “St. David’s experience.” I drive by the location of the old church every now and then (It is not called St. David’s anymore; the diocese renamed it years later.) and look on the location as one views the cemetery wherein their great-great-grandparents are buried. There lies my heritage, but it is a heritage I know little of. I think of St. David’s Day almost like a great-great-grandfather’s birthday, a time when you should take a moment and share some of the rich heritage of your ancestors in the faith. Since I do not have any experience from the old St. David’s days, I will instead share some elements from the life of St. David himself. 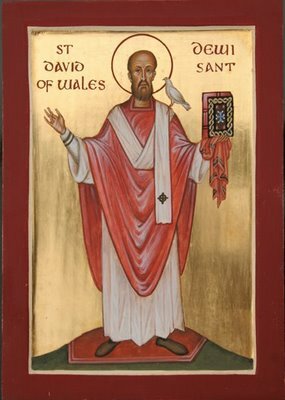 Saint David was born to Welsh nobility in the late fifth or possibly early sixth century. The Anglo-Saxons had invaded Britain by that point and had driven most of the inhabitants into what was known as the Celtic Fringe: Scotland, Ireland, Wales, Cornwall, and Brittany. The Welsh countryside was rocky, hilly, and, though quite lovely, rather inhospitable compared with the majority of England. David became a monk and founded several monasteries. There is even one story that claims he founded the legendary Glastonbury Abbey. That legend is almost certainly false, but it is quite possibly that an addition to the monastery dating back to the sixth century can be attributed to St. David’s work. Another legend says that he was consecrated a bishop at the hands of the Patriarch of Jerusalem, which would have meant David undertook an incredibly lengthy and dangerous pilgrimage at the time. St. David was so popular during his own lifetime that when people gathered to hear him, so many crowded around him that those in the back could not hear his message. St. David was said to have laid a handkerchief down on the ground, stepped on to the cloth, and immediately a hill rose up under him so that all gathered around could both see him and hear his preaching. 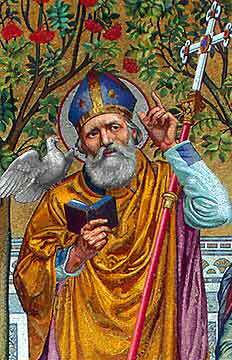 St. David has also been associated with the dove (as an image of the Holy Spirit) and with the leek, an onion-like vegetable which is to the Welsh what the clover is to the Irish. When the Church in Wales had grown sufficiently, due in large part to St. David’s teaching, one of the four original Welsh dioceses was named St. David’s. 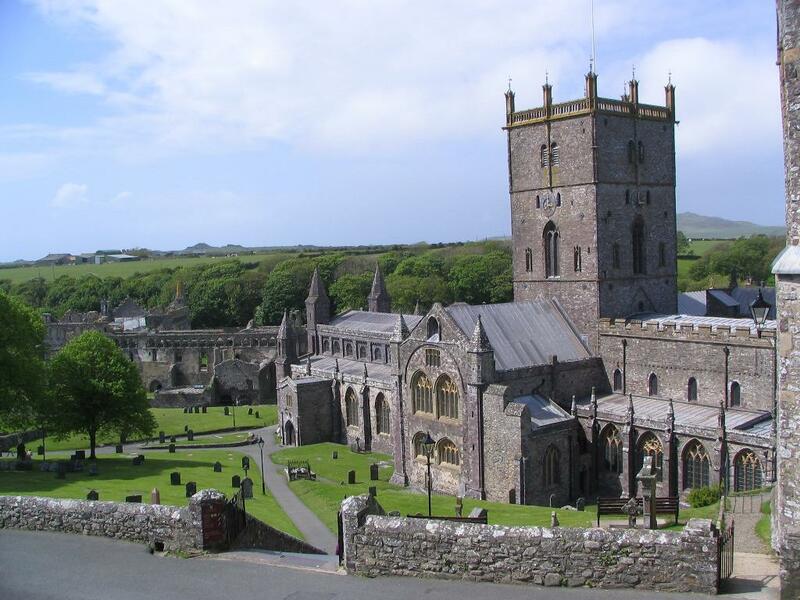 During the Middle Ages, two pilgrimages to St. David’s Cathedral counted as one pilgrimage to Rome for the purposes of calculating indulgences. In Wales today, the people are wrapping up a week of national celebration. For them, the celebration of their patron saint is a cross between St. Patrick’s Day and a cultural heritage festival. It is also worth noting that, unique among the patron saints of the British Isles, only St. David was born in the land he represents. St. Andrew (Scotland) was a Jew; St. Patrick (Ireland) was British; St. Alban (England) was Roman. This was by no means the greatest history lesson that I have ever put together. When you gather around your grandmother’s knees and ask her for stories of her grandfather, you do not receive a history lesson. You get stories of a beloved ancestor. May we remember our past and celebrate our heritage. Almighty God, who called your servant David to be a faithful and wise steward of your mysteries for the people of Wales: Mercifully grant that, following his purity of life and zeal for the gospel of Christ, we may with him receive the crown of everlasting life; through Jesus Christ our Lord, who lives and reigns with you and the Holy Spirit, one God, now and ever. AMEN.